The guides are the best! At least that is what our guests tell us in all sincerity. We have a great team of guides from all over Mexico as well of course as our local experts. They are all bilingual and have an extensive knowledge of Baja and its extraordinary natural history. Besides taking an enthusiastic delight in sharing their knowledge, they are genuinely wonderful, caring and intelligent people to share your vacation with. The BOA super pangas (motor boats) are masterly skippered by local fishermen, Edgar, Yasir and Gabriel! They are the back-bone to the BOA team. Always cheerful and their amazing boat handling skills give evidence to a lifetime on the sea. On our fully catered trips you will be delighted with fine dining as they turnout incredible feasts each day often catching and serving up 'gifts from the sea'. Many guests wish to return just for the food and seek out our secret recipes! Meanwhile, in the office you will find our bi-lingual staff Beatriz and Ceci ready to answer your emails or telephone inquiries, to take care of your hotel reservations and to ensure each and every trip is prepared right down to the finest detail. Chino is one of our local guides, born and raised in La Paz and has been guiding with BOA since 2005. He has a deep passion for the ancient history of the peninsular and takes great pleasure in sharing his in-depth knowledge of his forefathers - the early human settlers to this region of Mexico. Likewise Chino loves to talk about the geology, flora and fauna and the current local culture in Baja California Sur. He is certified with 3 stars by the BCU and WFR by WMI of NOLS. Besides guiding, Chino has been actively involved in organizing several public, artistic, cultural and social events. All this aside from his "other" job as a graphic designer in science, tourism, environment and conservation. One of his great contributions to social awareness was through the production of a documentary about Baja California Sur. Chino won an award through the Youth Institute of Baja California Sur with the highest public recognition that the State provides to young Mexicans: "The State Youth Award" for his community work. Y como digo una cosa, digo otra y pienso que todo tiempo pasado, fue anterior. Leah is our token Canadian guide, born and raised in Vancouver, British Columbia. After years of instructing on the mountains, she has taken a liking to Baja's warm winters. 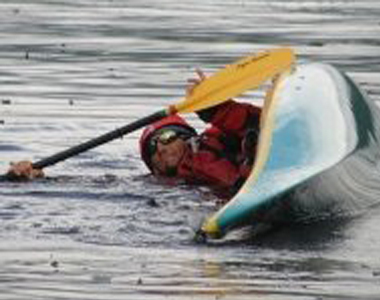 Leah has a diploma in Outdoor Recreation Management from Capilano College in BC and has been kayaking since 1996. She loves being outside in any kind of weather and is a keen kayaker and rock climber. She has a profound interest in marine life and is especially interested in the Humpbacks and Orcas. Leah has been guiding in Baja since finishing her practicum with BOA over 11 years ago. Born and raised in La Paz Baja California Sur, Pedro is our natural born athlete. His passion for sports and nature could only lead Pedro in one certain academic direction: a degree in Alternative Tourism at the University of Baja California Sur. 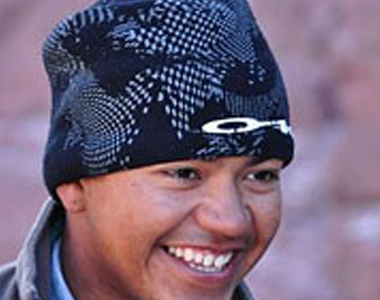 Following graduation, Pedro became a tour guide in 2005, organizing expeditions through the Gulf of California and Pacific Coast in the Baja California Peninsula. Always full of energy and optomism his knowlege, experience, and skills make him a pleasure to be around. Then when Pedro is not out in the field guiding, he is out in the field on an ultra-marathon. In 2013 he competed in the Baja 'sea to sea' race and was one of only two competitors that could complete the gruelling 130 klm race that included scaling the 7,000ft mountain range of Sierra de la Laguna - all in one day! Mario grew up in Mexico City but at every opportunity he escaped the concrete jungle to bike and climb in the surrounding mountains. When he finally moved to La Paz in the summer of 2006 he quickly became an invaluable member of the BOA team. His first years were spent in logistical support but it was inevitable that someone possessing so much passion for the outdoors, would sooner or later earn him a place in the 'field'. Mario is as comfortable under the water as on it and delights in helping new comers discover the pleasures of snorkeling in the famous under water world of the Sea of Cortez. You will find that his genuine enthusiasm to assist others creates a reassuring feeling that you are undoubtedly in the best possible hands. Pez que lucha contra la corriente, muere electrocutado. Aracely was born in Nicaragua and moved to Mexico in her teen years where she went on to study marine Biology in La Paz's nationally acclaimed university. Through her studies she has now focused her life on the outdoors and in particular, marine protected areas in the Gulf of California. This in turn, has led Aracely to participate in research projects involving coral and rocky reef systems, whale behavior and marine conservation. She frequents the ocean bottom scuba diving for work and for pleasure.When guiding for BOA she particularly enjoys watching people's reactions as they discover the abundant life in the coastal waters of Espiritu Santo Island. 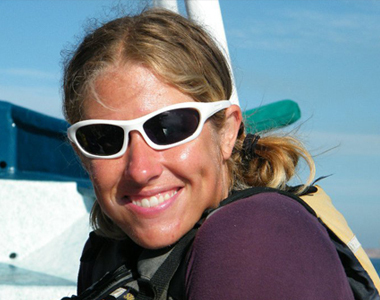 She interprets each kayak trip as another great opportunity to teach and learn more with every group. Si la montaña viene hacia ti, corre!, es un derrumbe. Cecilia was born and raised in La Paz. Her parents are both ocean skippers so naturally they enthused Cecy with a love and respect for the Sea of Cortez and its enormously diverse underwater world. She began her career working directly for the association of hotels and tourism in La Paz. She then turned to BOA to enjoy meeting and assisting directly with international travelers. One of Cecy�s important roles is developing the BOA social network so if you want to share some photos, Cecy is the one to contact! Originally from Uruguay, Diego has now taken up permanent residence in Baja California Sur. Naturally as a professional surfer he has chosen to reside on the Pacific coast of Baja where he is chief lifeguard of the main Todos Santos beach. Diego began guiding trips in La Paz over 10 years ago and has a marvelously charming approach to hosting trips. Perhaps it's the South American style! His expertise in the field and knowledge of the area will quickly make you feel that you are in very safe hands. Rafael Camposeco is an archaeologist from the rural state of Michoacan. His fascination in tracing the origins of human beings in America led him to Baja California Sur where he fell in love with the beautiful contrast of the ocean and desert landscape. Following his university studies, Rafael gained an opportunity to work as an archaeologist in the Sonora desert as well as in the Cape Region of Baja. He then began guiding for B.O.A. 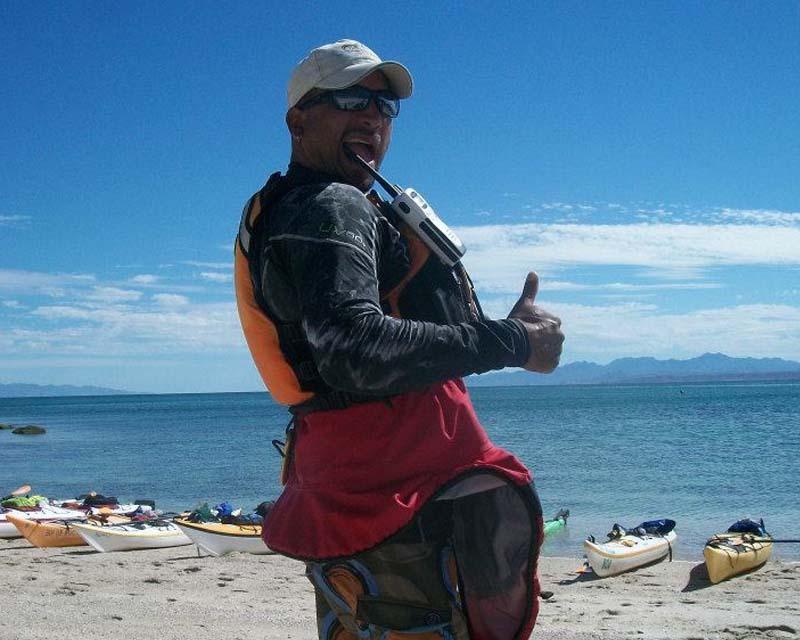 in the winter of 2002 learning not only the secrets of kayaking, but also the greatness of the Sea of Cortez. Rafael's passion for the outdoors is immediately apparent and his vast knowledge of the natural history that extends into modern day life in Baja is inexhaustible. He loves to talk with guests about the extraordinary fauna and flora and his explanation of how the former inhabitants of Baja lived off the land is intriguing - make sure you ask! 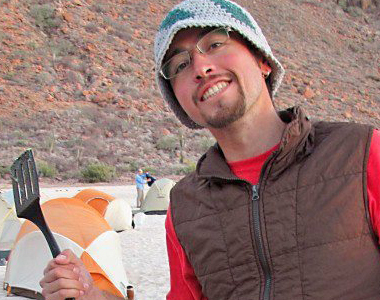 Tulio Lot is one of BOA's invaluable biologists and he has developed an 'encyclopedia of knowledge' relating to the ornithology in Baja California Sur. His passion for observing sea birds at close quarters, led him to spend two months on a remote island off mainland Mexico where quite literally his only companions were the sea birds. Tulio's dedication to kayaking and adventure has taken him off to British Columbia, Canada and the Pembrokeshire Coast National Park in Britain. One of his future plans is to paddle the entire Baja Coast in the Sea of Cortez. Antonio nació y creció en el Puerto pesquero de Guaymas, Sonora, también ubicado en el Mar de Cortés. Proviene de una familia de pescadores de donde heredó su gran pasión por el mar y la naturaleza en general. Utilizó un kayak por primera vez en el 2009 y después de años de explorar la costa del golfo de California en kayak, se mudó a La Paz para estudiar Biología Marina desarrollando un interés tanto por los ecosistemas de costa y desierto como por compartir sus conocimientos de historia natural de la flora y fauna del Mar de Cortés. De cada diez personas que miran televisión, cinco son la mitad.